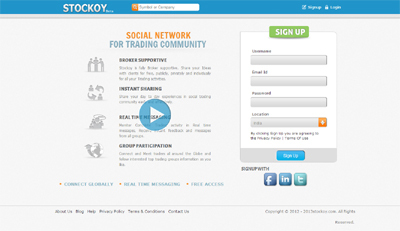 Stockoy.com is Social Network website for Trading Community .It is a best place to connect stock people and Get guidance from experts publicly , privately and individually. you can share Ideas, Messages,charts, Videos with common interests people globally across 14 countries Instantly.It is the best platform to build your own social network with stock people for all your trading activities. Stockoy has developed a new communication system that helps Stock Market people,Traders,Agents, Brokers,Franchise Managers in a faster and effective way .Here you can get Real Time Messaging system that performs public interactions and Private Messaging with Multi Country Support options.